It’s April. 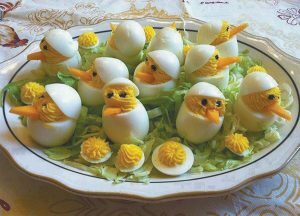 Easter comes late this year so you have plenty of time to practice making these cute egg chicks! Let the grandchildren help you. Make great memories. 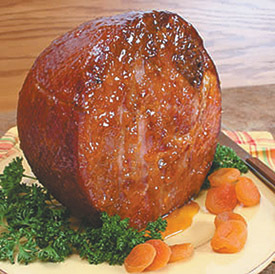 for 20 minutes per pound or until ham is heated through and thermometer reads 140 degrees. Yield: 10 to 14 servings. Slice a small portion off of one end of the egg. This will allow it to sit upright. Cut about 1/3 to 1/4 off of the other end. Scoop out yolk. 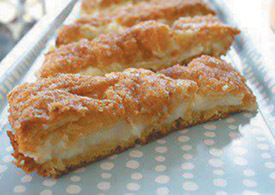 Blend the yolk, mayo, lemon juice, mustard, salt and pepper to a creamy consistency. Use pastry press or plastic bag with a corner snipped out to refill the eggs. Put the tops back on at an angle. Decorate with the peppercorns and carrot or cantaloupe pieces. Arrange on a platter with shredded lettuce as the nest. 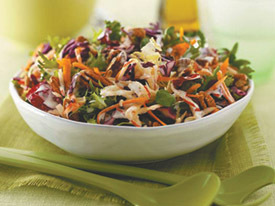 Cut the cabbage, carrots and apples Julienne style either using a knife or food processor. Toss in the sesame seeds in raw or pre-toast them lightly in a frying pan. Mix all of this together. For the dressing, combine the ginger, vinegar and oil and stir with a spoon. Add this to the cabbage, carrots and apples evenly. Top with more sesame seeds (fantastic source of Calcium). Salt and pepper to taste and add pecan nuts for a delicious nutty taste. Excellent salad for heart and brain health.